You wouldn’t think a falling bicycle could be so dangerous. If I was riding it, sure. But not a bicycle falling down next to me! This time, I wasn’t even riding my bicycle and I was injured. 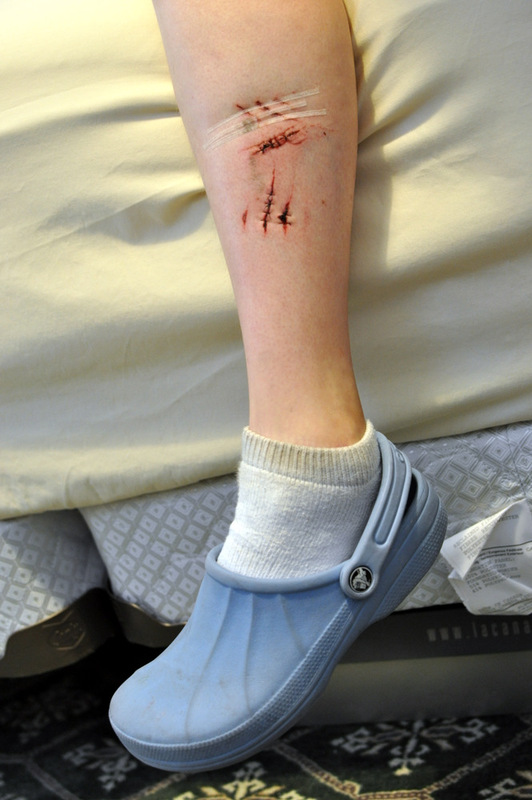 I was standing next to my bicycle, as it was falling, and the front chainring (or chainwheel or spikey teeth where my gears change) decided to take a piece out of me. A few pieces. A few deep chunks of me. I saw my subcutaneous fat before I started to bleed, and knew it was bad news. In the next instant, blood was pooling down to my sock. I declined an offer for a napkin to wipe the blood off and softly said, “I just need to get to work.” The nice stranger probably thought I was nuts. Of course, with an injury like that, it only makes sense to wish you were at work if you worked at a hospital! I hopped on my bike and rode off. I eventually found my way to the emergency department where I was cleaned up and stitched back together (thank you year 2 medical student). My supervisor remarked that after enduring the injury, freezing and stitching, I deserved a treat. He suggested ice cream. Interesting idea, I thought. Instead of ice cream, I plotted and schemed. I had some avocados at home that I had forgotten to add to some tacos, and I knew exactly what I wanted to do with them. 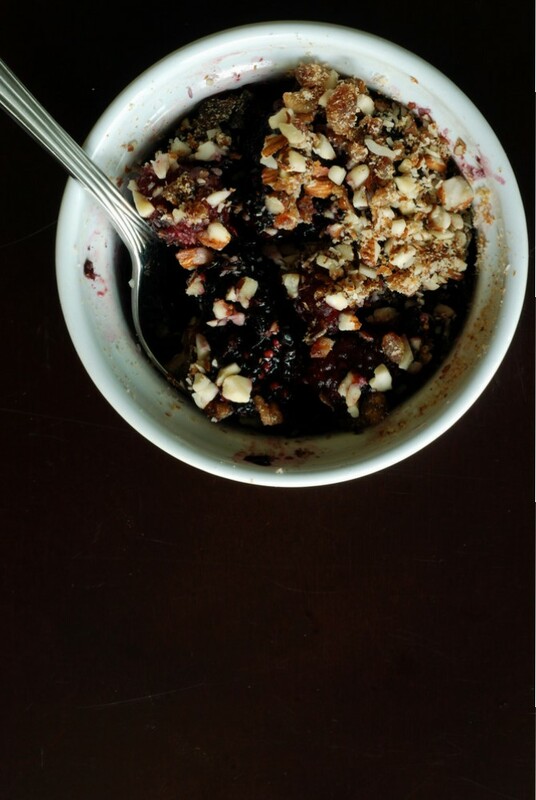 A quick, decadent treat. 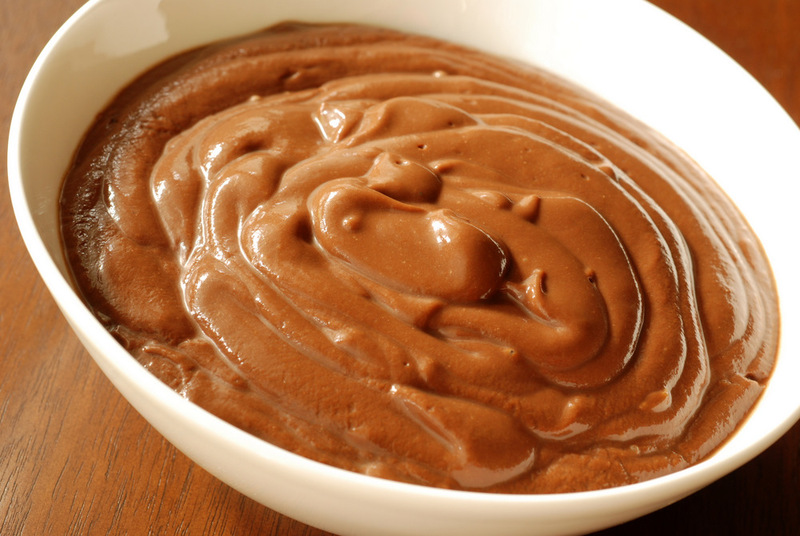 Definitely not your typical mousse, it is a light chocolate pudding with a hint of spice. Not airy as you would expect in a mousse. If you would like more of a pudding, don’t add any water but it was good both ways. I adapted Gena’s chocomole, to include a bit of lemon juice, a dash of cinnamon and cardamom and swapped agave nectar for the dates. Next time, I may omit the water completely, and try adding some almond or hazelnut butter for added richness and a more pudding-like consistency. For something more airy, I may try this cashew-based recipe instead. Thank goodness I have another avocado! But I won’t wait for a pity-party for my next chocolate fix. No worries about me, though, because my leg is doing fine, as am I. In fact, the worst thing that has happened is that I am now wearing skirts and dresses (pants irritate my stitches). Becoming quite feminine with my masculine injury, eh? This is my submission to Ricki’s new Summer Wellness Weekends. This was my first time cooking millet. I still have some learning to do. There is a trick for plump and fluffy millet. I think I goofed when I stirred in some miso after it had cooked, and forgot to plump it up again. Still, fresh, the millet was lovely. Leftovers, talk about clumpy. My mission: figure out how make the best fluffy millet. Because it isn’t just for the birds. Nutty and reminiscent of spongy couscous, I really liked it! 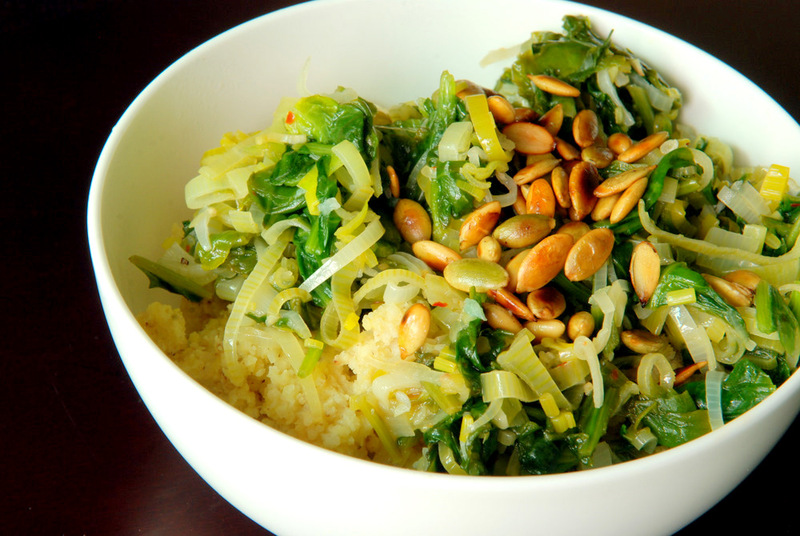 Here, a big bowl of millet is topped with pan-seared leeks and spinach, spiced with garlic and chili flakes. 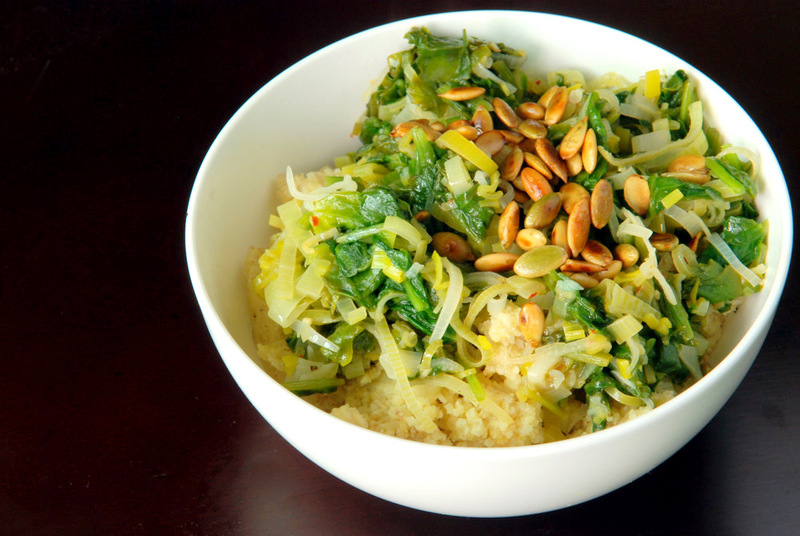 Lime juice adds a nice acidity and the toasted pumpkin seeds add a subtle crunch. 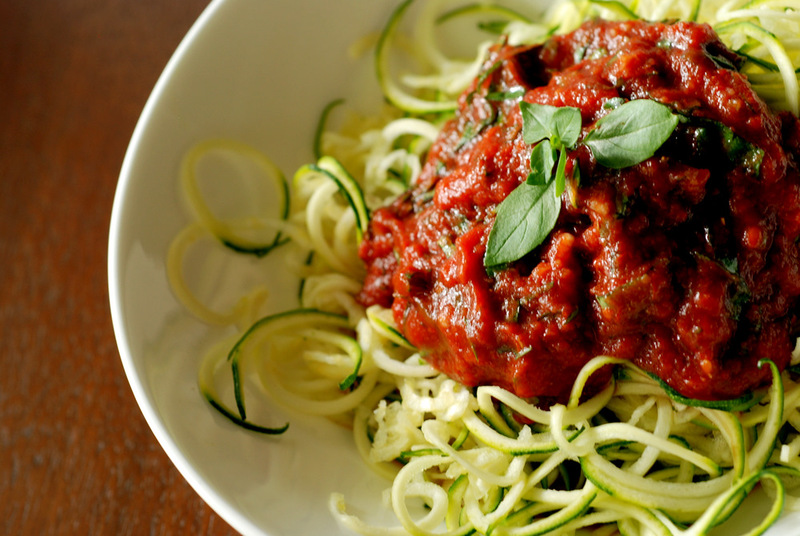 I adapted the recipe from Whole Foods to Thrive, a nice cookbook highlighting recipes from multiple raw/vegan restaurants across North America, as well as simple home recipes such as this. The original recipe suggested adding the miso the boiling water with the millet. However, I always thought one wasn’t supposed to boil miso to maintain its nutrients. Instead, I opted to stir it in afterwards. Since miso is a sticky paste, this probably wasn’t the best idea, and could have contributed to its stickiness. Next time, I may omit the miso in the millet and add it to the veggies. 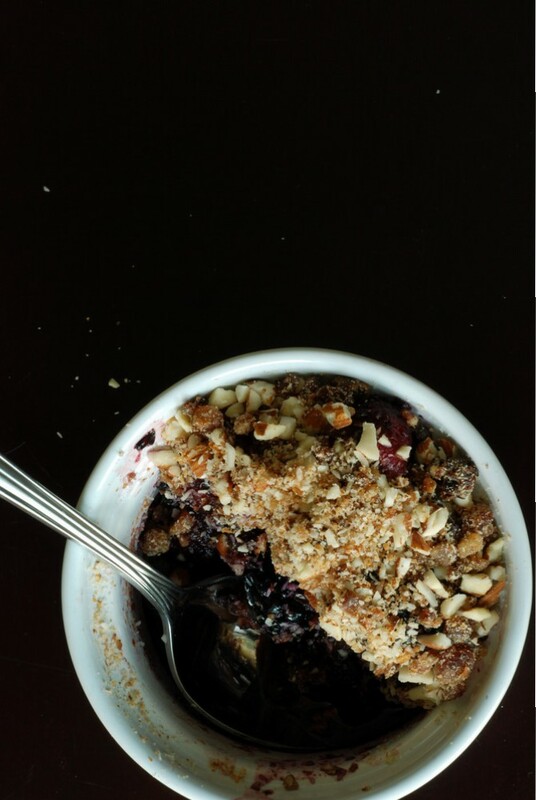 This is my submission to this month’s Simple and in Season, to this month’s Healing Foods featuring whole grains and to Ricki’s new Summer Wellness Weekends. 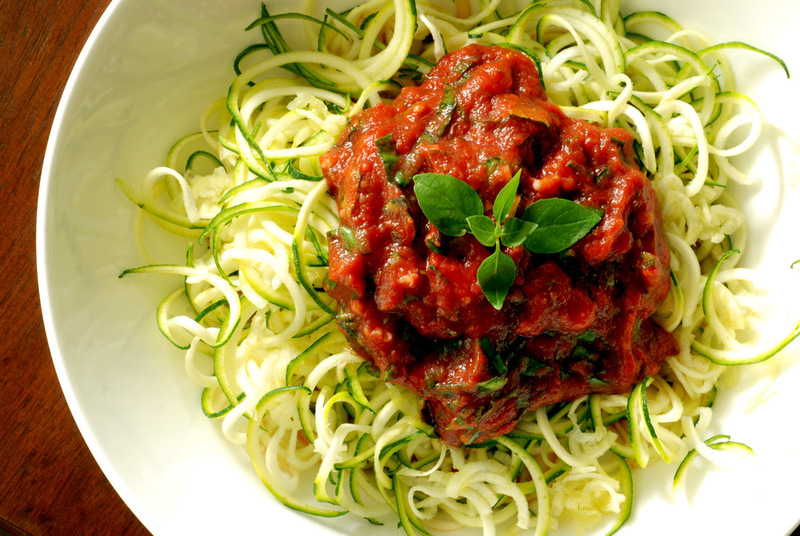 Indeed, I am really enjoying my spiralizer. But in my life BTS (before the spiralizer), I was still able to make interesting textures from my vegetables. Usually my Santoku knife got the job done (tedious, but can julienne just fine). Sometimes I would use my mandoline to help with thin, even slices. Then there were times where my vegetable peeler was the best thing around. Like for this ribbon salad. 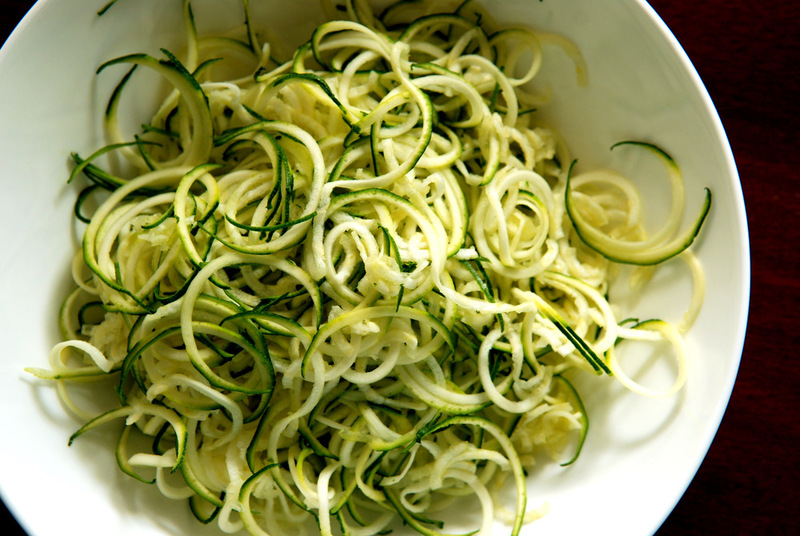 You can make ribbon salads from a variety of vegetables – zucchini, carrot, and cucumber, to name a few. 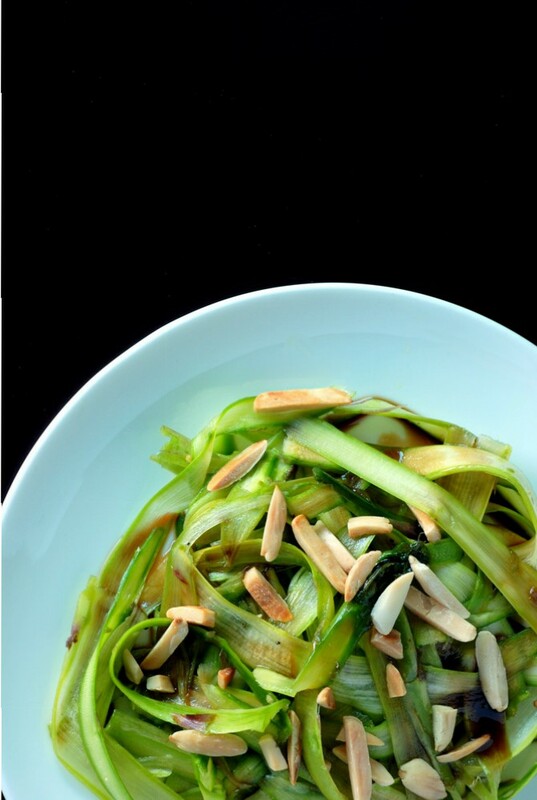 I am still relishing in local asparagus, and after ogling many shaved asparagus salads, I finally jumped on the bandwagon when I spotted a recipe for a shaved asparagus salad with a balsamic reduction and almonds. I never knew how diverse asparagus could be. 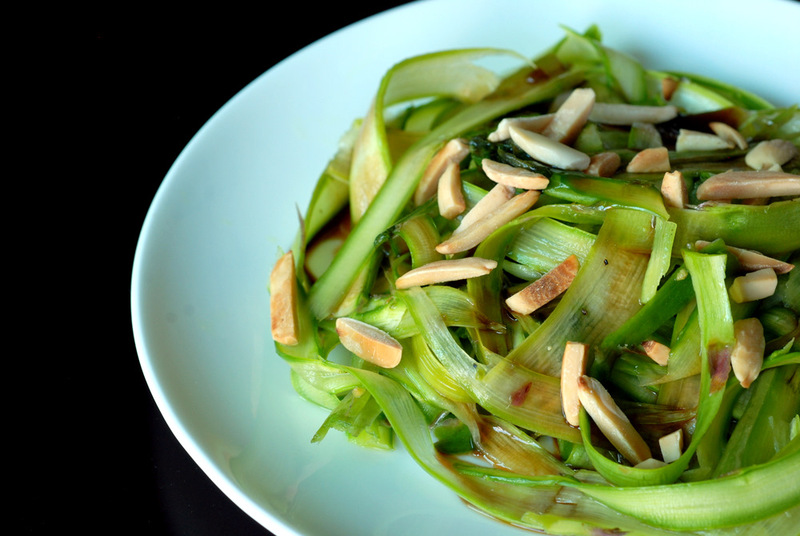 Yes, asparagus can be eaten raw and it is lovely eaten as ribbons. Ribboning asparagus can be a tedious process, so this is when you actually want to buy the big, fat asparagus (usually I aim for the thinnest stalks possible since they tend to be sweeter). It is easier to grasp the plump spears and lay them flat as you peel away each layer. 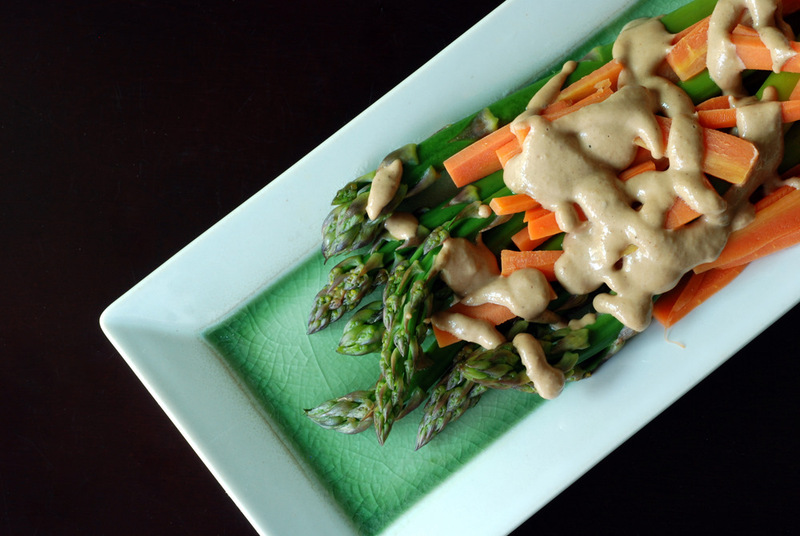 Highlight your peeling efforts with a remarkably simple, yet sophisticated dressing. You can never go wrong with mosto cotto, an aged condensed balsamic vinegar, and here it is complemented by the sweet earthiness of asparagus and the sweet crunch from the almonds. 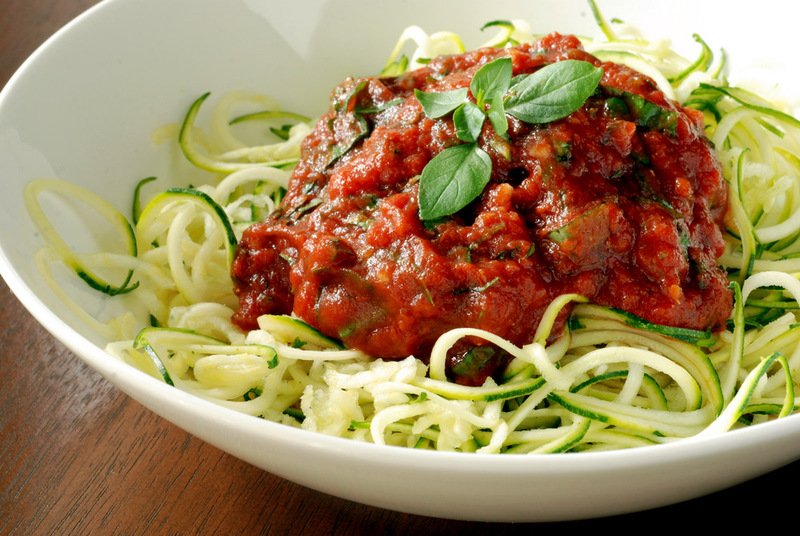 This is my submission to Deb for this week’s Souper Sundays, to this week’s Healthy Vegan Friday, to this month’s Simple and in Season, and to Ricki’s new Summer Wellness Weekends. Figures that all I want to make are baked beans. Turning on my oven when my house is already 28C inside. I must be nuts. Nuts for beans, of course! I am not bent on making your typical ooky sweet ketchup baked beans. I’ve already done the non-traditional, but uber delicious Mango BBQ Beans (not baked but the stovetop preparation makes this much more summer friendly!). I am talking around-the-world type of baked beans. 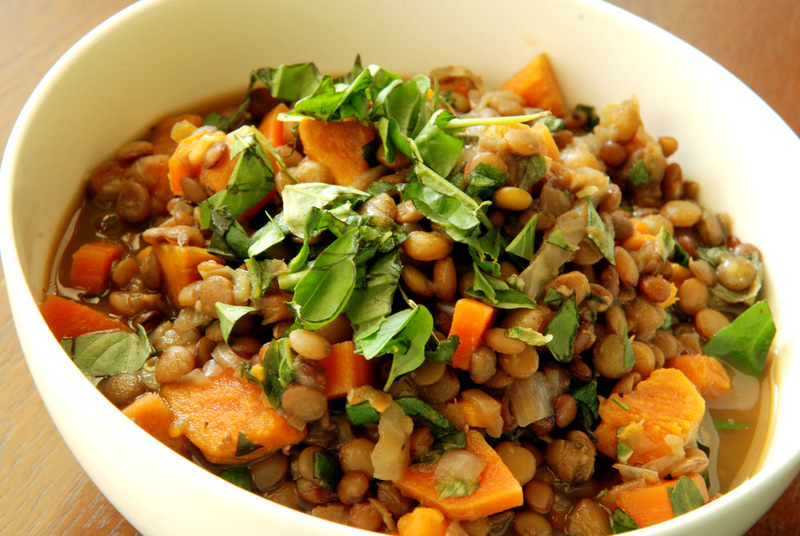 Because, every country has a different spin on the classic bean dish. As Canadians, we add maple syrup. Apparently vegan New Brunswick-style is to use blackstrap molasses and ginger for a zippy punch. Or I could go more into southern soul cooking, using baked black eyed peas. 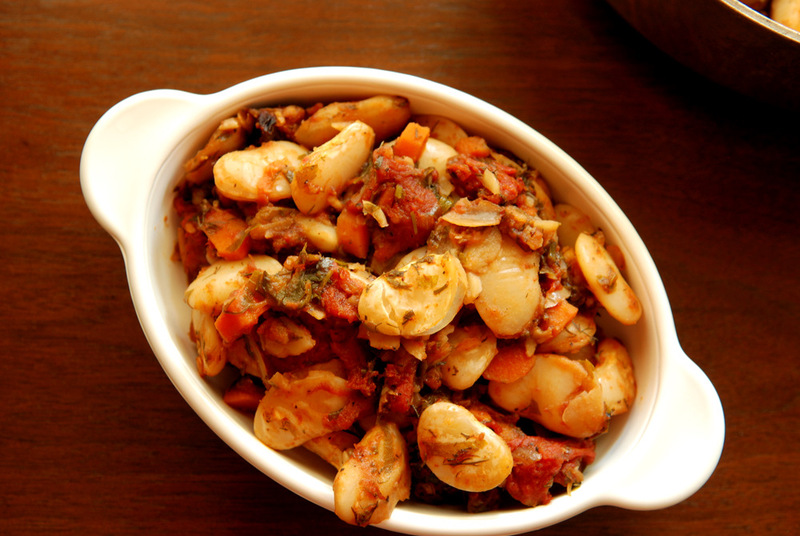 How about Mexican-style with Anasazi Beans Baked with Ancho Chile? Then there’s Sephardic White Beans with Leeks. 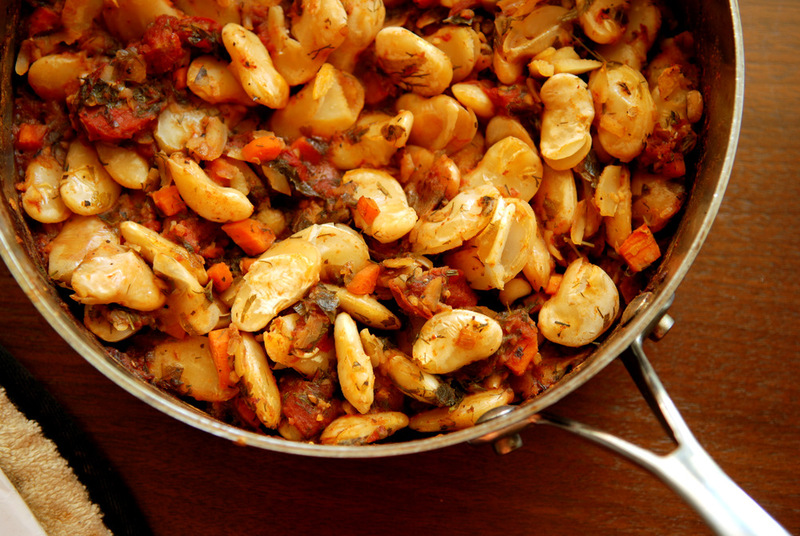 Substitute the leeks with onions, add allspice, cinnamon and cloves, and you have Syrian baked beans. 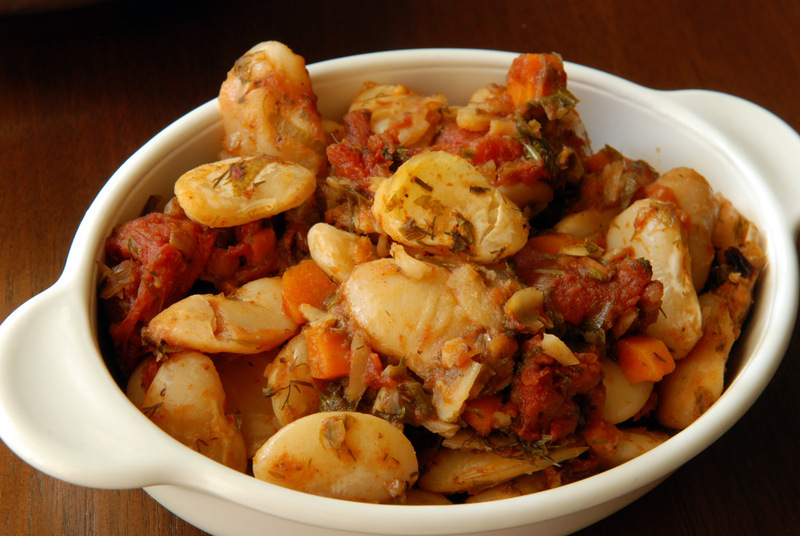 Or, for a Tuscan influence, bake your white beans with sage and tomatoes. Or try it with rosemary and thyme, instead. If you were Serbian, you’d bake your white tetovac beans with sweet paprika. When in Nigeria, you might add curry powder, cumin, coriander, and peanut butter. A quick glance onto my back porch, with its bountiful flat-leaf parsley, steered me into the direction of Greek Baked Beans (Gigantes Plaki), where giant lima beans are baked with a luscious tomato sauce spiced with smoked paprika, oregano, garlic, parsley and dill. Already a creamy bean, the giant lima bean is brought to a silky high as it is baked in a delicious sauce. Baking confers even heat distribution and somehow allows the beans to continue to become creamy without losing its shape. 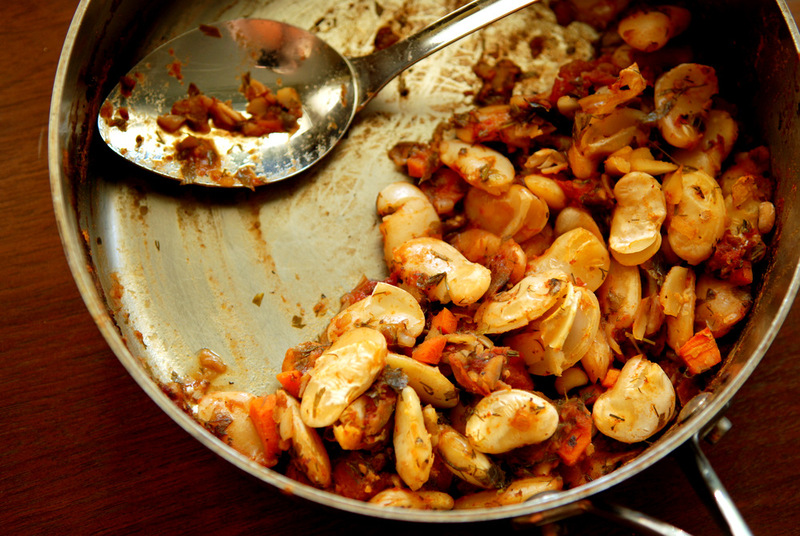 Lima beans, if overcooked, can quickly disintegrate into mush if you don’t watch them carefully while they are cooking. Browning the beans during the last 15 minutes, allows a slightly crusty exterior to the top beans. The mixture of textures is wonderful. Serve slightly warm, or at room temperature, with slices of bread, or just as is, which is my preference along with a sprinkling of fresh herbs. I fully intend to explore the world of baked beans, one country at a time. 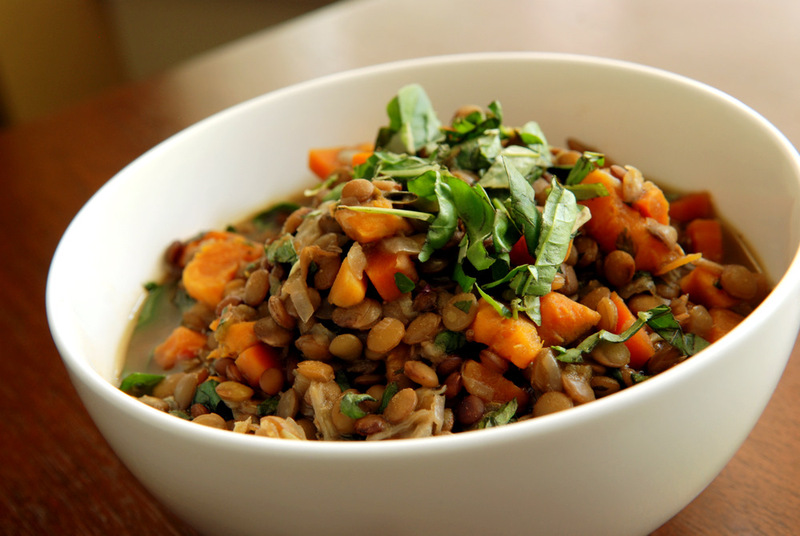 This is my submission to this month’s My Legume Love Affair, hosted by Susan, to E.A.T. World for Greece, to this month’s Simple and in Season and to Ricki’s new Summer Wellness Weekends. Not all nuts are created equal. I have a particular fondness for almonds, pistachios and even hazelnuts on a good day. I adore cashews as well, although they have saturated fats. Walnuts, I do not like as much. Pecans, neither. But I still use walnuts in my meals. All those omega-3s are good for me, right? Beyond their health benefits, I find they can whip up to be nice and creamy, and have worked well in my energy balls and create a nice base for muhammara, the delicious Middle Eastern roasted red pepper and walnut dip. However, I find that baklava is brought to the next level when you substitute the (traditional) walnuts for pistachios. With my recent adoration of all things miso, I decided to forge ahead and combine miso with walnuts in this warm asparagus and carrot salad. 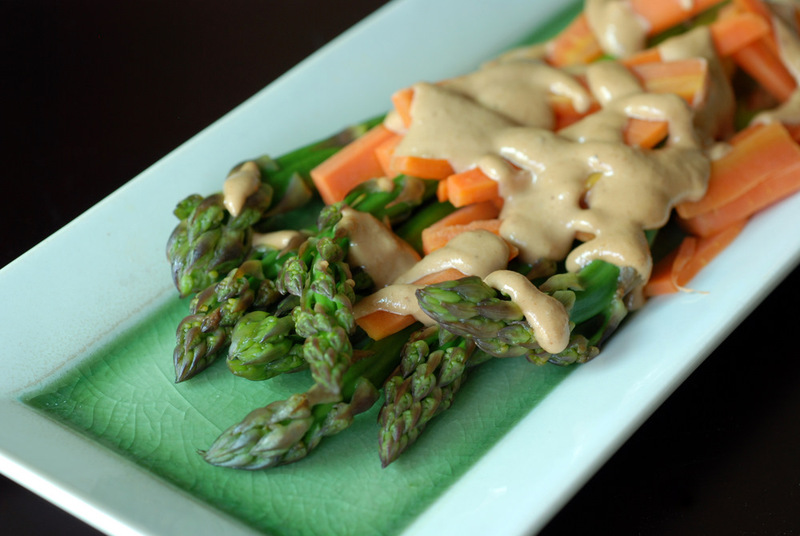 Adapted from Color Me Vegan, you create a lovely miso-walnut dip with mirin, tamari and rice vinegar. It was sweet and creamy and spread nicely over the warm vegetables. Thankfully in Southwestern Ontario, local asparagus can still be found! 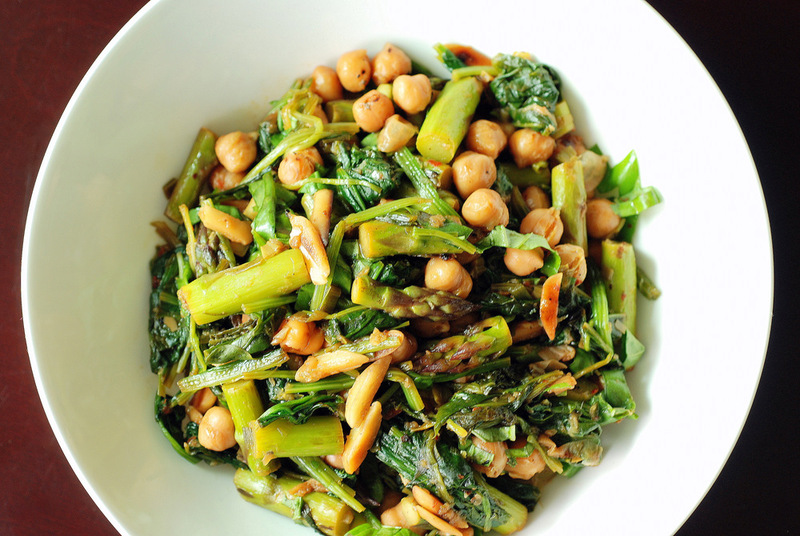 It paired well with the asparagus and carrots, but do not let that stop you from trying other vegetables. 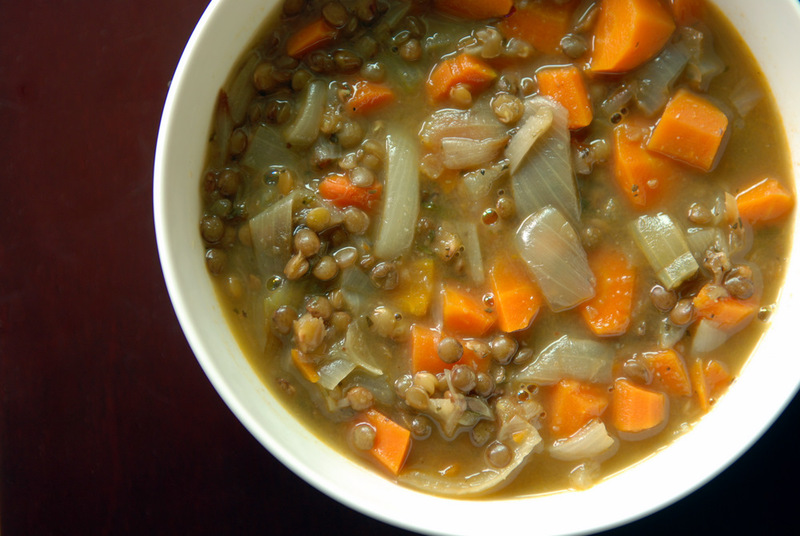 I also loved this as a cold dip with freshly-cut vegetables as well (again, carrots worked well!). 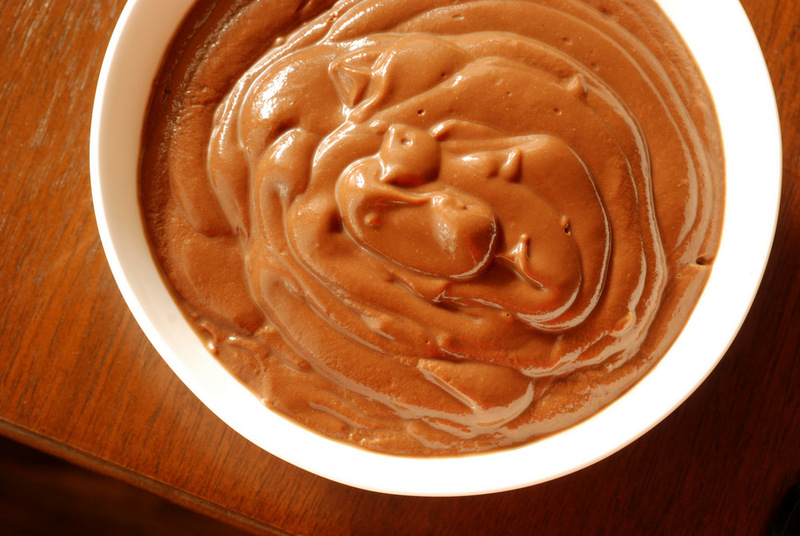 However, then you’ll need to make a lot more of the dip, because it will disappear quickly! This is being submitted to this week’s Weekend Herb Blogging, hosted by Chriesi from Almond Corner. Rob has the privilege of having a nice breakfast supplied at work. Each morning, the offerings vary from pancakes, waffles, bacon, sausages, croissants, danishes, muffins, oatmeal, muesli, yogurt, fruit salad, dried fruit and nuts. He complains about the breakfast, though, and shuns most of the menu. Sub-par baked goods and homemade oatmeal that tastes better, he usually opts for the fruit salad with yogurt and dried fruits and nuts. But even then, he complains about the fruit salad. Too much filler, like honeydew and cantaloupe, where is mango? He wants more pineapple, strawberries and blueberries. Add some papaya, while you’re at it. Apple and pear, too. He wants ginger. Yes, I am typing this up verbatim as he tells me all his breakfast fruit salad desires. He has been dubbed a food snob by his co-workers. Rightfully so, if I may add. To be honest, I felt quite liberated when I stopped eating from the (rare) free lunches provided at work. But if fresh fruit or a nice salad is available, I will gladly snack on that. Melons don’t tend to get the respect they deserve. After biking, sometimes all I wanted was a big piece of watermelon. And while Rob prefers cantaloupe over honeydew (both “filler” fruit), I prefer the reverse. On the fruit echelon, berries rank high for me, but variety is important as well. Cantaloupe very rarely gets paired with anything… a loner, or sometimes with honeydew. Hidden within a fruit salad, it can go unnoticed. Or shunned when it takes centre stage. 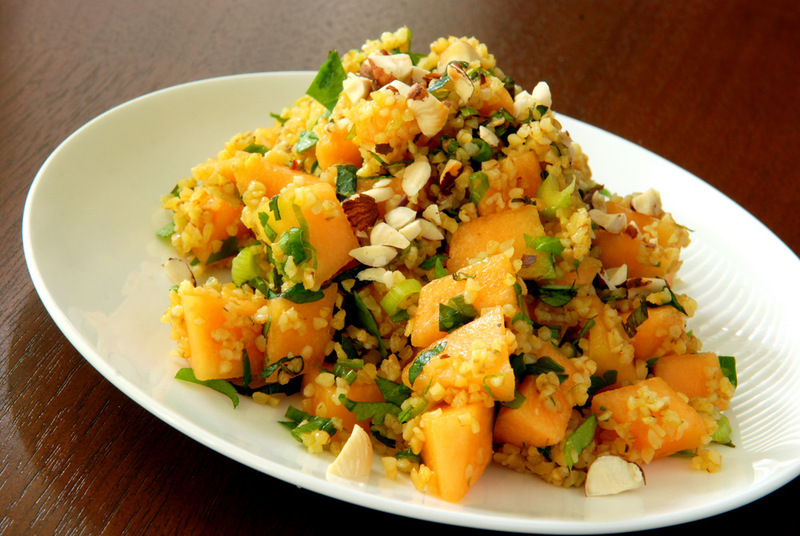 I enjoy combining fruit into savoury dishes, and my curiosity was piqued when some friends recommended the bulgur and cantaloupe salad in Supermarket Vegan. 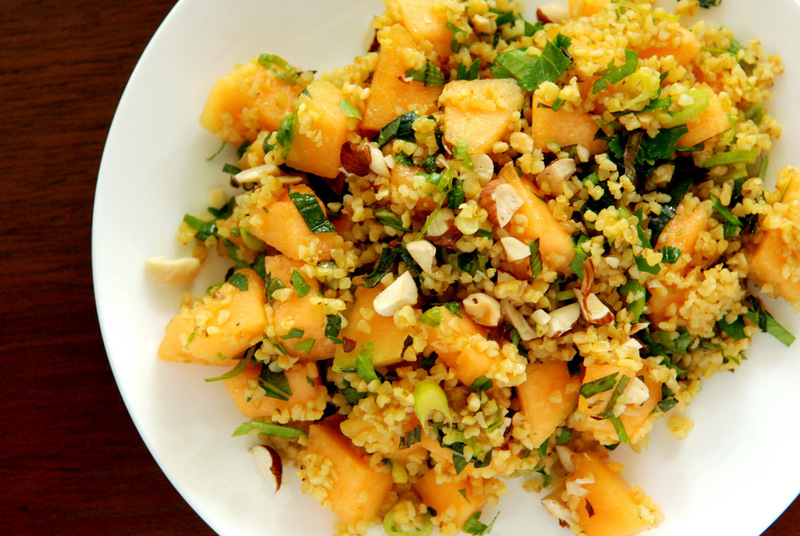 Here, we have a seemingly simple salad but the citrus-spiked bulgur salad works incredibly well with the cantaloupe. As with any salad, quality ingredients make this jump to the next level. First the cantaloupe. I increased the ratio of cantaloupe-to-bulgur ratio, opting to use an entire small cantaloupe for the salad. Choose a firm not overripe cantaloupe for best results. Next, fresh orange juice is key and I squished 2 Navel oranges to reconstitute the little nuts of bulgur goodness. The original recipe suggested a fine-grain bulgur but I used medium-grain which was perfect. I swapped the herbs around, opting for more fresh mint than parsley, and felt that both had a roll in the flavourful salad. For my nut of choice, I went with hazelnuts that I had unearthed during our move. Again, who would have thought it would work so well? 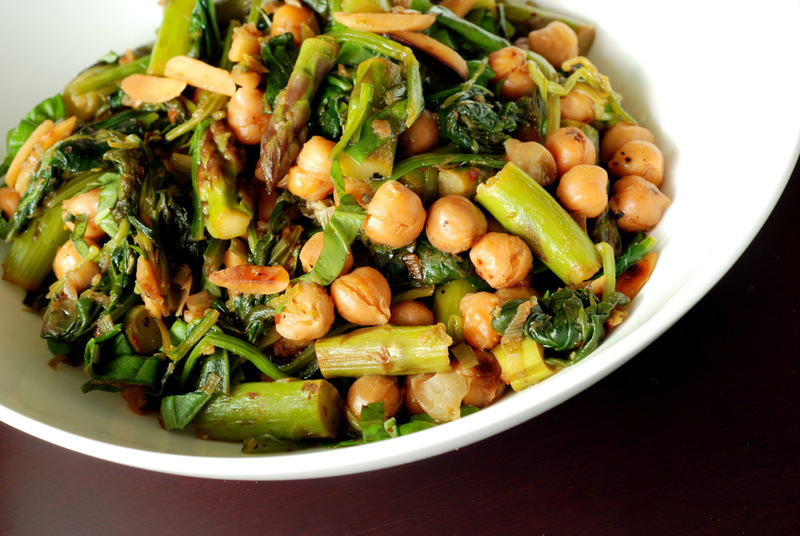 I ended up adding cooked chickpeas to the leftover salad to turn it into a main meal and it was equally delicious. 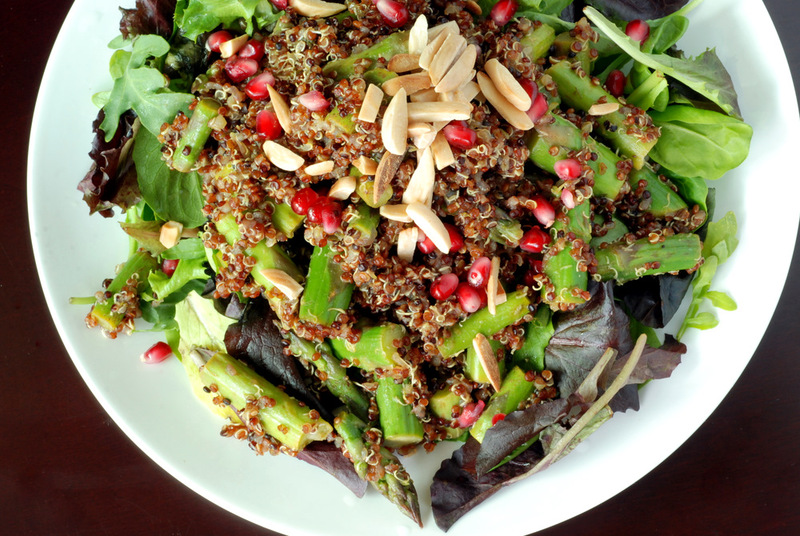 Heck, who would have thought this whole salad would taste so good? Cantaloupe, you are definitely an unsung hero. This is my submission to Deb for this week’s Souper Sundays, and to this month’s Healing Foods featuring whole grains, to this month’s Simple and in Season and to Ricki’s new Summer Wellness Weekends. I feel bad for cabbage. It has become my go-to veggie this summer, actually. It gets shunned like tofu because it is oftentimes poorly prepared. If you want the best, sweetest cabbage, I suggest braising it for 2 hours. However, I can’t do that every day, especially in the summer when I’d rather not use the oven. 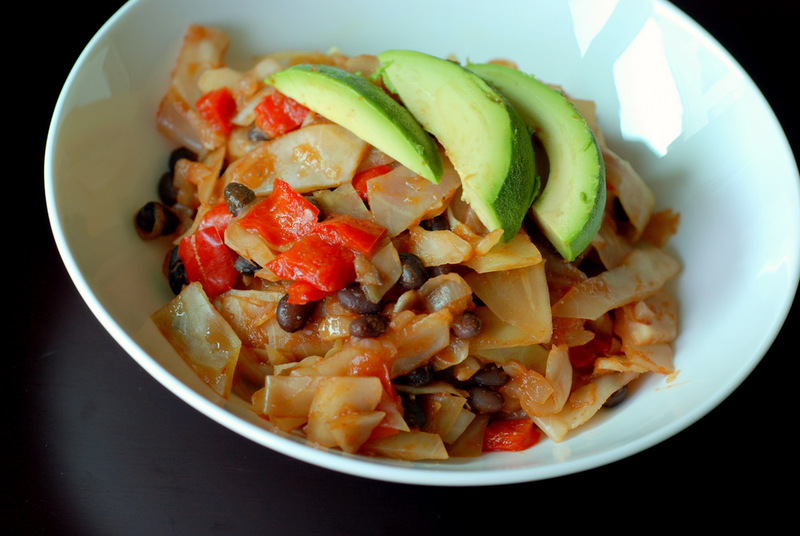 But just like tofu, a cabbage dish can be more about its accompanying ingredients than anything else. Who says cabbage needs to be boring? 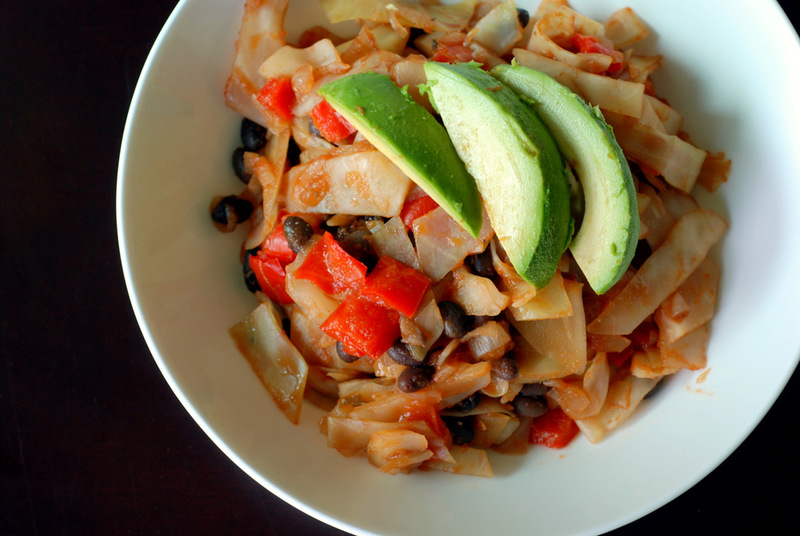 Adapted from Happy Herbivore, this is a quick stir fry overflowing with cabbage. Mexican in its flavours with a tomato-based sauce spiced with cumin and oregano, there are also red peppers and black beans for a healthy punch. Top with avocado for a creamy accent. I found this worked perfectly as a meal for 2-3, but if doubling for a larger portion, you will definitely need a big skillet! This is being submitted to this week’s Weekend Herb Blogging, hosted by Rachel from The Crispy Cook. I didn’t think I was going to eat any sushi while I was in Vancouver. Trust me, I didn’t succumb to the traditional sushi rolls. Instead, I had a delicious raw sushi roll at Organic Lives. Completely inauthentic, it was filled with a pecan pate, sprouts, veggies, avocado and mango. With the zippy fruit-based dipping sauce, it was so completely different from any sushi roll I have ever had. The only similarity was that it was a nori roll wrap. When I visited Japan, one of my favourite meals was eating sashimi at the Tsukiji Market, which is the wholesale marketplace for seafood in Tokyo. With daily auctions, this is where you can eat the freshest fish. The sashimi was unbeatable. I have never been able to enjoy sea urchin anywhere else. So fresh, it was so buttery soft and creamy. I actually visited Tsukiji two days in a row and sampled sashimi from two different vendors. Both times, I ordered a sushi bowl with an assortment of sashimi. One resto had better sashimi and the other had better rice. The rice was so good, it eclipsed the fish. And I don’t really like rice, actually. I consider it filler in sushi rolls, when I would rather be eating the filling. I tolerate rice for the most part, but here, I learned how great rice can taste. I have experimented with a few rices since my return, and I still remain partial to a short-grain Japanese-style rice. Recently, I bought the Taiwanese Yih Chuan Aromatic Rice, which has a faint aroma of taro (yes, on sale at T&T). It brings rice to the next level. The rice is nicely flavoured, shaped and most importantly, tastes great. 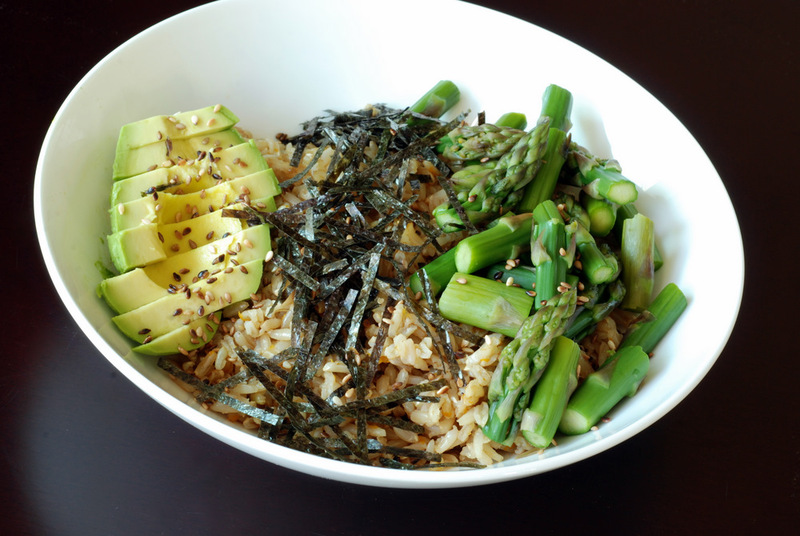 My whole preamble about rice is because if you are going to make a sushi rice bowl, you should try to use a nice rice! The dressing helps, too. The toppings, too. But let the rice get the spotlight it deserves as it isn’t supposed to be a bland side. Adapted from 101 Cookbooks, I wouldn’t call this an authentic Japanese recipe, but a lively citrus-flavoured sushi bowl. Top with your favourite sushi toppings such as steamed asparagus, avocado, grilled tofu, and dare I suggest mango? (Mango, next time…). 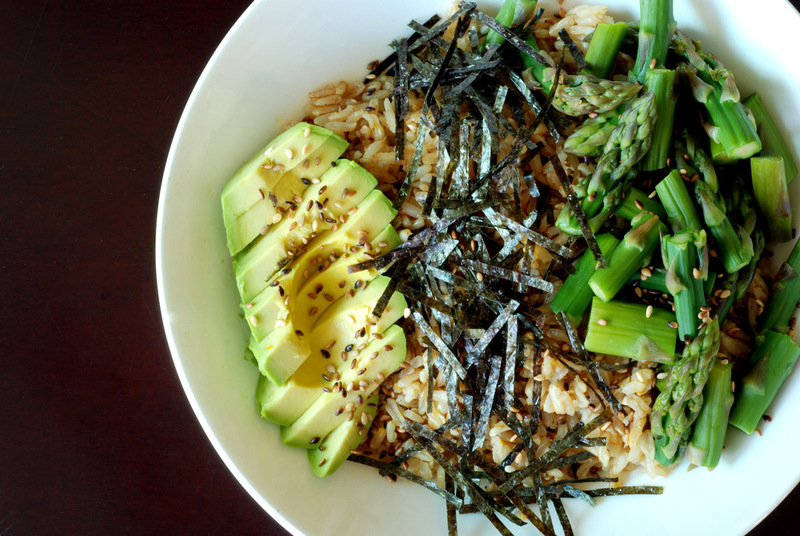 The key to keep this a sushi bowl, and not a rice salad, though, is to include the toasted nori strips. You can buy them pre-shredded, but you could also toast the nori and then cut it into thin strips yourself. I may have lamented about the explosion of condiments, but I am positive Rob was perplexed by my fascination of his hot sauce collection. Coming from me, the Queen of Non Spicy. Before we moved in, I kept interrogating Rob. Do you have sweet chili sauce? Yes. Followed by, I put it on anything! It is my favourite condiment! Do you have sambal oelek? No! That stuff is too spicy even for me! Do you have harissa? What’s that? 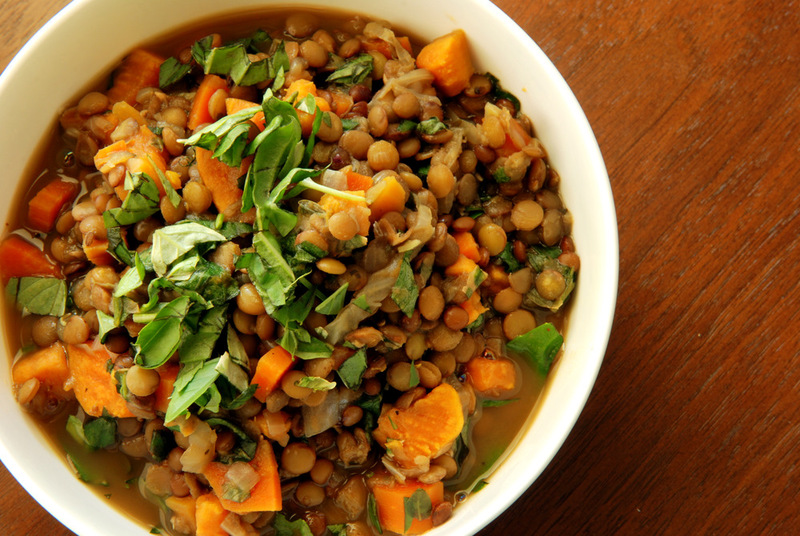 By this time, I had my heart set on making this lentil stew with roasted carrots, harissa and mint from Love Soup. My usual go-to substitution of all things chili is my beloved Aleppo chili flakes that I bought in Turkey, more flavourful than spicy. Then I investigated harissa, a Tunisian pepper paste, and found that it seemed more savoury than spicy with roasted red pepper combined with coriander, cumin, cinnamon and caraway. While you can purchase harissa, the bonus, of course, of making it yourself, is that you can change the recipe to your own palate. While a mixture of hot and mild chilies, like Ancho and New Mexican chilies, are suggested for harissa, I based my version on Bon Appetit‘s recipe since it focused on chili flakes, not whole Ancho chilis. In fact, while modifying the recipe, I was quite bold as I doubled the Aleppo chili flakes, as they are known to not be too spicy. I also substituted cumin for the caraway, added a dash of cinnamon and omitted the sugar. All the spices were toasted and freshly ground. Since I was a bit hesitant how I would handle it, I only made a 1/4 of the recipe the first time. But I did not need to worry: this zingy but savoury red pepper blend is delicious. 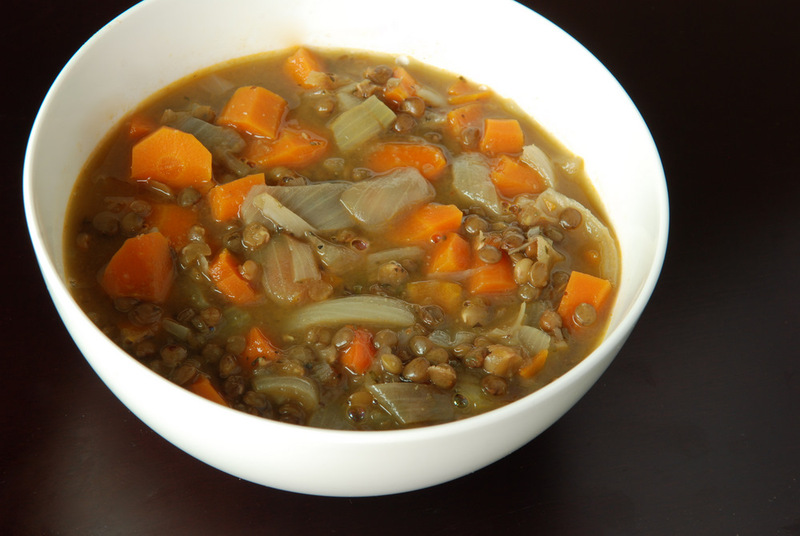 It works really well with this soup and while you could make the soup without the harissa, I think you would be missing out on its complexity. This is my submission to Deb for this week’s Souper Sundays, to this month’s Veggie/Fruit A Month with carrots, to this month’s No Croutons Required featuring hot peppers, to E.A.T. World for Tunisia, to Ivonne at Cream Puffs in Venice for this week’s Magazine Mondays, to this month’s Simple and in Season and to Ricki’s new Summer Wellness Weekends. But let me tempt you with another delicious salad. It may not be the typical pomegranate season, but they were on sale at Sunny’s last week. Pomegranates from Chile must have their own special season. . which thankfully allows me to enjoy pomegranates in the summer! Now to bring back the bulgur bonanza! This is my submission to Deb for this week’s Souper Sundays, to this week’s Healthy Vegan Friday, and to this month’s Healing Foods featuring whole grains, and to Ricki’s new Summer Wellness Weekends. Hi! It’s Rob again. I know that I haven’t posted here in a while. A few months ago I was worried about Janet’s blog when she was going through a really busy time at work. I’ve realized, however, that Janet has many dozens of recipes on deck waiting to be posted and she always had things well in hand. I knew that The Taste Space would forge on boldly without my extra help. I’m back, though. A couple days ago I made a salad which both Janet and I agreed was the best salad we’d ever had in our lives. It was simply amazing. There was a cacophony of bold flavours bursting with every bite. There were so many things going on. Every portion was enhanced for extra action and pleasure. I knew that I had to share it here. 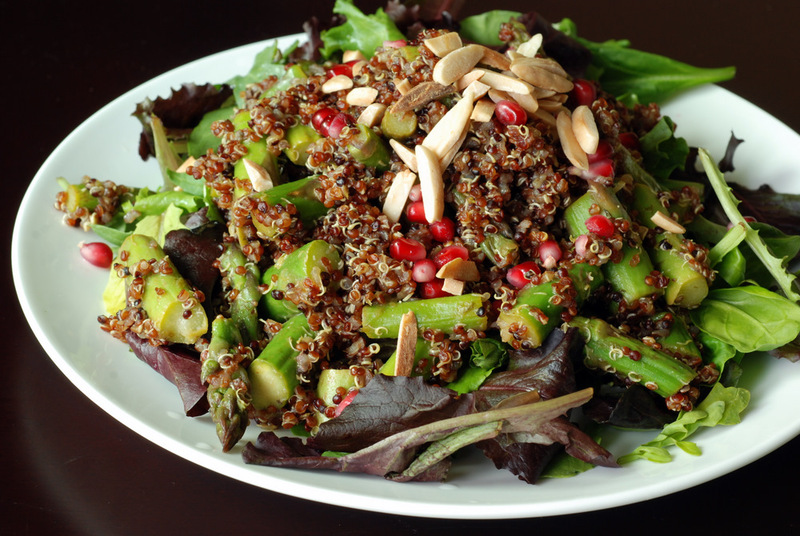 The salad is the Uptown Salad, adapted from Radiance 4 Life by Tess Challis. Janet suggested it to me as something that was up my alley. It only took me a few seconds of looking at the recipe for me to decide that I had to make it. 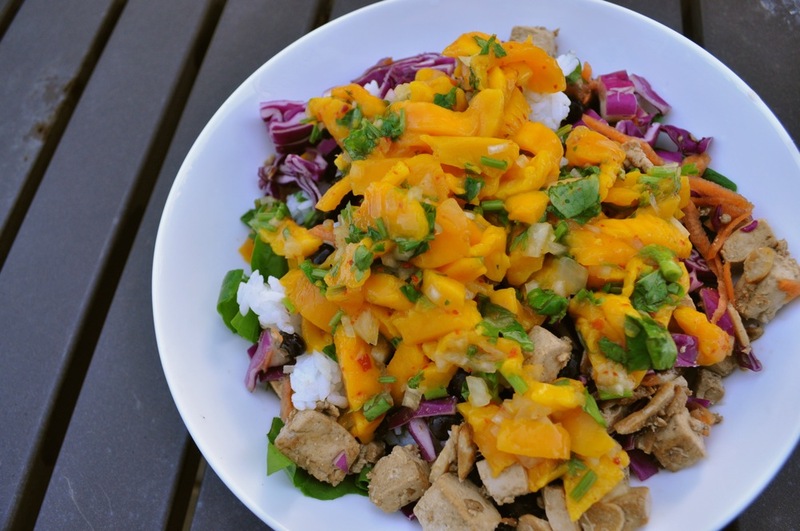 It hit many of my ingredient buttons: mangoes, coconut, tofu, cilantro, citrus, and chilies. And that’s the just the beginning. The recipe suggested that it would take 30 minutes (or less!) to prepare the recipe. No way. It took me an hour and a half of chopping, shredding, soaking, slicing, and frying. I was getting cranky by the end. This salad was more work than advertised. The verdict was going to come when we finally got to try it. Janet occasionally uses some swear words. She’s generally a good girl, though, and restrains herself. However, when she tried the Uptown Salad there was a foul concoction of some four swear words in a row. These words were not uttered in anger. They were the stunned response of a girl eating the best salad she’d ever had in her life. These words were an emotional response of extreme awesomeness. This is a salad with the power to move you. While I have upgraded from a condo-sized fridge, the new full-sized fridge seems so full already as it is nearly packed with condiments! Three tahinis… three bottles of toasted sesame oil… three bottles for soy sauce (which I promptly removed from the fridge)… and Rob, alone, had all things tamarind and mango: 2 containers of tamarind concentrate, tamarind chutney, mango ginger chutney, mango chili sauce, pickled mango in oil. I am no saint, either, bringing the isoteric umeboshi plum paste, hoisin sauce, oyster sauce and some peach-mango salsa, amongst many, many others! Actually, I love isoteric ingredients… the duplicates bother me. 😛 For some reason the soy sauce bottles are NOT built to add liquid in the other way. I have wanted to make my own hoisin sauce, ever since Rose posted her recipe and I spotted an even more compelling version in The 30 Minute Vegan’s Taste of the East. However, until I finish the bottle in the cupboard, I will be using the jarred variety. I am a late bloomer for discovering the quick and easy nature of stir fries, where anything goes, but decided to try to use some of the condiments in the fridge in a stir fry. First one: hoisin sauce, the salty-sweet Chinese barbecue sauce. 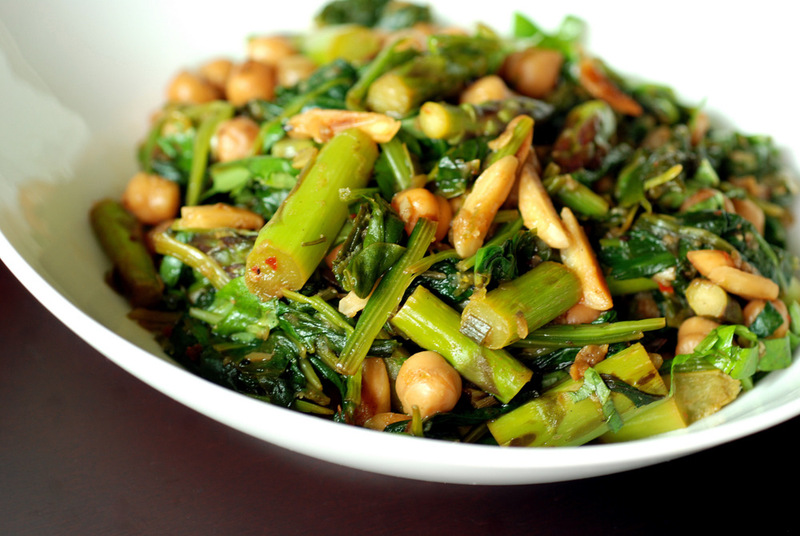 For other hoisin sauce love, try my Tofu Hoisin with Baby Bok Choy.